NOTE: This is a tandem post; Molly's commentary is left-aligned, Audrey's is right-aligned and italicized. I think we can all agree Christmas season starts December 1st. Not before Thanksgiving, but as soon as Thanksgiving happens, haul out the holly and deck the halls because it is officially Christmas season. And it doesn't start mid-December like some people chose to believe. We're big fans of Christmas around here. And we hope you are, too. Because we are ready to get in the spirit, culinary style. Starting with these apple pie babycakes*. Apple pie may seem like more of a Thanksgiving treat, but I think you can get away with it throughout the holiday season. Put it this way: serve a warm apple pie a la mode on Christmas Day, and I don't think you're going to hear much protest. Serve these apple pie babycakes and I bet you'll even get a few "oohs" and "ahhs." These babycakes are special. Holidays are special. Even I can do that math. *babycake: n, cupcake disguised to look like a tiny layer cake; see also: freakin' adorable, cuter than a button. To make these babycakes, you're going to have to master the ancient art of Momofuku. Okay, so it's not exactly ancient, but it is an art form. Have you ever made a Momofuku cake before? We have. It's an involved, multi-step process, but it's oh, so worth it. A Momofuku cake is distinctive for two things: it's unfrosted exterior, and the multiple layers you can see exposed on the finished product. This is layer cake like you've never made - or experienced - before. We're not just talking cake and frosting here. We're talking cake, soak, filling, topping, frosting, repeat x2. Full-fledged Momofuku cakes are 3 intricate layers tall; our babycakes are a modest two. Despite being so tall and so many-layered, Momofuku cakes are actually not as decadent as you might think. I attribute this to the finely-tuned balance of perfect proportion in the recipe. If you sample each layer individually, they will only be just okay. The frosting might seem a mite too salty, the cake not quite as moist as you might like. But combined...combined, the proportions come together to sing in perfect harmony. Personally, I think the layers taste pretty wonderful alone. But, for example, when you try the cheesecake you can't possibly imagine how wonderful and apple-pie-y the final product will be. It's truly some kind of magical. 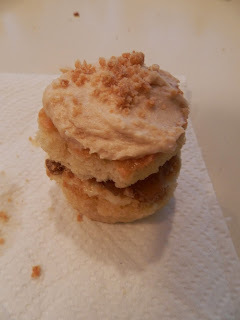 Last year, Audrey and I turned sweet potato casserole into cupcakes. We wanted to continue that tradition of remixing Thanksgiving classics this year. This is right up my alley, because as I told you recently, I'm not a big fan of fruity pie. Which is what basically every classic Thanksgiving dessert is. So we started thinking of ways to turn pie into...not pie. If we polled Americans to find out what people considered to be the Ultimate All-American Thanksgiving Dessert, I'm pretty sure 85% of respondents would say apple pie. Even I sometimes cave and find myself enjoying a slice in spite of myself. It's that ingrained in our collective, cultural tastebuds. I think there might be something in the water. Because somehow, all Americans seem to like apple pie. But even though I may like the flavor combo happening in apple pie, it's still pie. So it could still be better. Like, made-of-cake better. We thought about creating our own apple pie cupcake recipe, but then I remembered that Momofuku had already done that for us, and that their recipe contained many of the components I'd been considering: brown butter cake, pie crust frosting, apple pie filling. So instead of starting from scratch, we decided just to take their recipe and miniaturize it. It is also scientifically proven that miniturizing things makes them 10x more awesome. Like horses are okay. But mini-horses? AH-dorable. (I am totally making a reference to Lil' Sebastian from Parks & Rec, yes.) Kittens? (AKA mini-cats) More adorable than cats. I really think the only thing that it less amazing in mini version is fun-size candy bars. **Step-by-step assembly guide to follow, with pictures. Brown Butter: To make the brown butter, place 2 tablespoons of butter in a microwave-safe bowl and top with a microwave-safe plate. Microwave for 3 to 5 minutes. The butter will pop while browning. Check the butter, and if not browned enough, microwave again in 1 minute increments. While the brown butter is cooling, stir periodically to incorporate the caramelized bits of butter. Cool completely. Combine the butters and sugars in the bowl of a stand mixer fitted with the paddle attachment and cream together on medium-high for 2 to 3 minutes. Scrape down the sides of the bowl, add the eggs, and mix on medium-high for 2 to 3 minutes. Scrape down the sides of the bowl of the bowl once more. Stream in the buttermilk, oil, and vanilla while the paddle swirls on low speed. Increase the speed to medium-high and paddle 5 to 6 minutes, until the mixture is practically white, twice the size of your original fluffy butter-and-sugar mixture, and completely homogenous. You’re basically forcing too much liquid into an already fatty mixture that doesn’t want to make room for it, so if it doesn’t look right after 6 minutes, keep mixing. Stop the mixer and scrape down the sides of the bowl. On very low speed, add the cake flour, baking powder, and salt. Mix for 45 to 60 seconds, just until your batter comes together an any remnants of dry ingredients have been incorporated. Scrape down the sides of the bowl. Mix on low speed for another 45 seconds to ensure that any lumps of cake flour are incorporated. Pam-spray cupcake pan and fill with cupcake liners. Fill liners 3/4 full. Bake for 20 to 25 minutes. The cakes will rise and puff, but will remain slightly buttery and dense. At 20 minutes, gently poke the edge of the cake with your finger: the cake should bounce back slightly and the center should no longer be jiggly. Leave the cakes in the oven for an extra 3 to 5 minutes if it doesn’t pass these tests. Take the cakes out of the oven and cool on a wire rack or, in a pinch, in the fridge or freezer (don’t worry, it’s not cheating). The cooled cake can be stored in the fridge, wrapped in plastic wrap, for up to 5 days. Whisk together the cider, brown sugar, and cinnamon in a small bowl until the sugar is completely dissolved. Put the cream cheese in the bowl of a stand mixer fitted with a paddle attachment and mix on low speed for 2 minutes. Scrape down the sides of the bowl with a spatula. Add the sugar and mix for 1 to 2 minutes, until the sugar has been completely incorporated. Scrape down the sides of the bowl. Whisk together the cornstarch and salt in a medium bowl. Whisk in the milk in a slow, steady stream, then whisk in the egg until the slurry is homogenous. With the mixer on medium-low speed, stream in the egg slurry. Paddle for 3 to 4 minutes, until the mixture is smooth and loose. Scrape down the sides of the bowl. Line the bottom and sides of a 6×6 inch baking pan with plastic wrap [the idea of this scared me, so I used aluminum foil]. Poor the cheesecake batter into the pan, put the pan in the oven, and bake for 15 minutes. Gently shake the pan. The cheesecake should be firmer and more set toward the outer boundaries of the baking pan but still be jiggly and loose in the dead center. If the cheesecake is jiggly all over, give it 5 minutes more. And 5 minutes more if it needs it, but it’s never taken me more then 25 minutes to underbake one. If the cheesecake rises more than a ¼ inch or begins to brown, take it out of the oven immediately. Cool the cheesecake completely, to finish the baking process and allow the cheesecake to set. The final product will resemble a cheesecake, but it will be pipeable and pliable enough to easily spread or smear, while still having body and volume. Once cool, the cheesecake can be stored in an airtight container in the fridge for up to 1 week. Fill a medium bowl halfway with cold tap water. Juice the lemon into it. Fish out and discard any seeds. You will use this lemon water to keep your apple pieces looking fresh and pert. Peel the apples, then halve and quarter them. Put each apple quarter on its side and cut a small slice down the length of the apple to remove the seeds and core. Cut each apple quarter lengthwise into thirds and then crosswise into fourths, leaving you with 12 small pieces from every apple quarter. Transfer these pieces to the lemon water as you go. Combine the pie crumbs, milk, and salt in a blender, turn the speed to medium-high, and puree until smooth and homogenous. It will take 1 to 3 minutes (depending on the awesomeness of your blender). If the mixture does not catch on your blender blade, turn off the blender, take a small teaspoon, and scrape down the sides of the canister, remembering to scrape under the blade, then try again. Combine the butter and confectioners’ sugar in the bowl of a stand mixer fitted with the paddle attachment and cream together on medium-high for 2 to 3 minutes, until fluffy and pale yellow. Scrape down the sides of the bowl with a spatula. On low speed, paddle in the contents of the blender, After 1 minute, crank the speed up to medium-high and let her rip for another 2 minutes. Scrape down the sides of the bowl. If the mixture is not a uniform, very pale, barely tan color, give the bowl another scrape-down and another minute of high-speed paddling. Spread the clusters on a parchment or Silpat lined sheet pan. Bake for 25 minutes, breaking them up occasionally. The crumbs should be golden brown and still slightly moist to the touch at that point; they will dry and harden as they cool. Unwrap cupcake and set it upside down. Put cheesecake on the same side that was soaked. Sprinkle some crumb on top of the cheesecake and push it in lightly with the back of your hand. Spoon on the apple pie filling. Frost (generously) the other half. Place it on top with the frosting facing up and sprinkle with more pie crumb.